Members of the Gallia Academy girls golf team accept the trophy following their Division II Southeast District championship on Tuesday in Circleville, Ohio. CIRCLEVILLE, Ohio — History made, again. 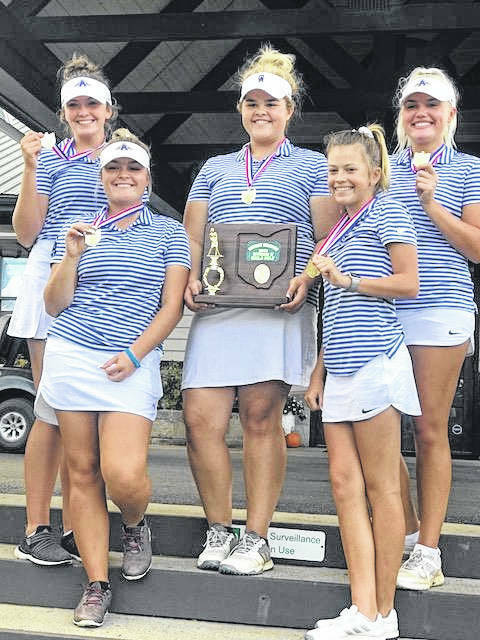 Four days after winning their first-ever sectional title, the Gallia Academy girls golf team clinched its first trip to the OHSAA State Championships, winning Tuesday’s Division II Southeast District tournament at Pickaway Country Club by seven strokes over Meigs. With only one team and one separate individual moving on to the state meet, the Blue Angels will be joined at the next level by district medalist Hanna Shrout, a junior from Fairland who recorded a 4-over par 76 for a four-stroke victory over Westfall freshman Maddi Shoults and Waterford senior Ashley Offenberger. In the play five, count four format, GAHS finished with a team total of 406, while Meigs recorded a 413. McClain was third with a 423, followed by South Point at 441, Logan Elm with 452 and North Adams with 453. GAHS junior Bailey Meadows paced the Blue and White with a 24-over par 96, the eighth-best round of the tournament. One shot back, Blue Angels senior Hunter Copley had the ninth-best round of the day with a 97. Fellow Gallia Academy senior Molly Fitzwater was one of three players tied for the 10th best score of the day with a 98, while sophomore Lilly Rees rounded out the team total with a 115. The Blue Angels’ potential tie-breaking round was a 119 recorded by Avery Minton. Meigs sophomore Kylee Robinson tied for the sixth-best round of the day, turning in a 22-over par 94. MHS sophomore Caitlin Cotterill and junior Mikayla Radcliffe carded matching 101s for the Maroon and Gold, while seniors Shalynn Mitchell and Lydia Edwards finished their careers with respective rounds of 117 and 122. The OHSAA Division II girls tournament will be held on Oct. 12 and 13 at the Ohio State University’s Gray Course in Columbus, with the Blue Angels first Friday tee-time scheduled for 9:50 a.m.